I've picked up some Gigabyte R9 280x cards recently. These cards seem to be locked and I've read about people flashing the bios to change the voltage. I gave this a go with Winflash. The moment this was done I got a blue screen and the PC would no longer boot. I forgot what I changed it to but I remember it was very close to the stock bios as this was just a test. Currently, the Bios for the motherboard only boots when I pull out the graphics card. Anyone got an idea on how to fix this? Thank you so much for the suggestion there. I looked for a switch and couldn't find it. Had another look and there it was.. so small. 1. Switch bios position on primary card... I imagine you are referring to the bios switch on the card. 3. Flash bios to other card? Wouldn't this mean that in copying the broken bios to another, it will break the card? 1. Has anyone here got a Gigabyte R9 280x and overclocked it? and can help me with a rundown on this please? 2. I would like to flash the other broken bios on this card, any tips for this? I'm still a real noob with this so I really appreciate your wisdom here. So far from searching here and on google I've found 3 people that mentioned they have undervolted. None mentioned if they did this with cards that had Hinix or Elpida Tahiti memory, which I've read have different ranges. I am looking to fix the broken bios first before I try flash the current one so I have a backup on the next undervolted flash. Currently, this Gigabyte 280x OC3GD v2. is working fine, however, on the backup broken bios the settings are 0.95v, 875/1250 (it looks like I didn't change the overdrive settings and they are still at 1500 for the max core clock and 2000 for the max memory clock. 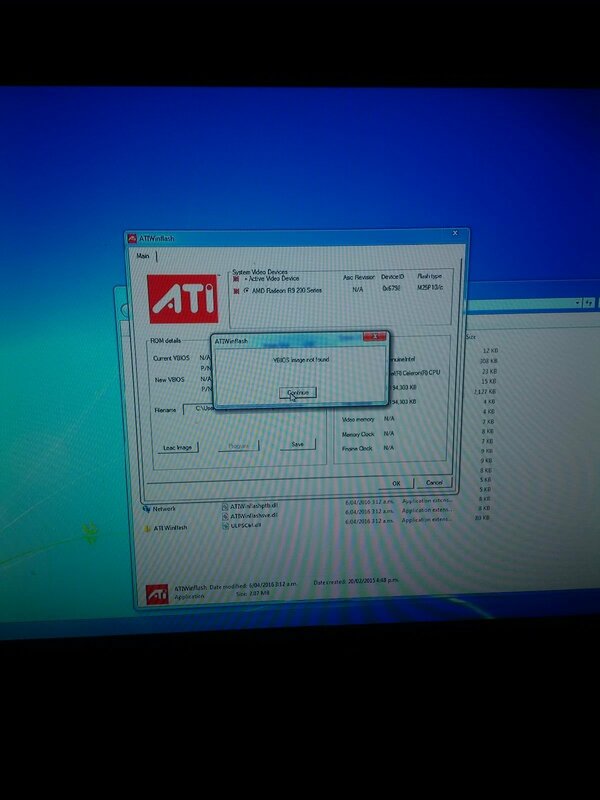 I used the latest VBE7 to edit the bios rom files and ATI Winflash to load them in. when u flip the bios switch on your card that should make it possible to use your card using that other copy of bios (assuming it's not tempered with in a strange manner, just as you did with first copy). flip the sw on one of your card to use other bios. Put it in first x16 slot and connect monitor to that gpu. Other card with broken bios put in some other pcie slot leaving bios sw as it is. power on pc, boot to win. flash other card with working bios wich you can extract from that working card. after that replace cards to flash working bios to first position of your other gpu so u have working copies on both sw positions. mine gb fw 280x is undervolted to 1,094V 1000/1500, elpida memory. hashing at 20.1 MHs, using VBE7 and ati winflash as well. Yep, I made a backup of the old bios. I was under the impression that there are two sets of bios roms for each card. If this is not true, are you meaning that I can flash my original bios and it will override both settings (whichever way I flip the switch?). If this is true, that would be great and it sounds easy! One more thing. Did you change the overdrive settings for in VBE7? for the max core & memory clocks. I tried to boot with both a good card as the primary and the bad card (trying every other PCIe slot). PC will not boot if ever the card with the broken bios 'on' is connected to the PC. Hrm. i was afraid you would say something like that, sorry but i've never had situation like that. i was always able to boot win after bad bios flash to secondary card. So your pc would not boot at all? would not past post? blank screen, absolutely nothing? If the card with the bad bios is connected, there is only a black screen after a reset. It doesn't boot and hence it is not possible to go into the motherboard's bios either. I can only imagine two ways to fix this at the moment. One would be if flashing the card copies to both bios switch settings, or if software exists to flash the bios that is switch off while the PC is running. I think I've read that the second option may be possible with an Ubuntu OS/boot disk. However, I am not sure because the PC does not get to that stage, to be able to boot from a USB drive. Also, I have never tried setting up linux so it sounds like a bit a headache hehe. From what I've read so far, there doesn't seem to be any advantage in running Linux as opposed to Windows 7, in terms of MH. Hey, I have a GV 280X v2 as well. 2 of them actually, and a 7970 as well. I've flashed all 3 of them. Only tried flashing to slot 1, I've always left slot 2 alone as my backup. All 3 cards are running undervolted at 1.05v. They are each stable at different cores and I haven't tried pushing them each as far as they can go. I know one of them I can only run somewhere around 1050 core as 1100 will crash drivers. But the other one runs 1100 no problem same voltage. Thanks for that Psipherious, just wondering what kind MH that gives you? Still looking to find a way to flash the bad bios on my card. Boot into windows while switched to the good side, than when booted, switch it, and flash with winatiflash. it will work. If both bioses won't boot, boot with another card while this one is inserted into second gpu slot. You can solve this. Don't worry! As mentioned above, if ever the card with the bad bios is plugged into another gpu slot, the PC will not boot. This is interesting though. Ok, boot into windows on the good flash.. While the card is in the main GPU slot connected to the monitor.. flip the switch and flash??? 1. Booted into Windows with good bios. 3. Loaded original card bios to ATIWinflash. 4. Flipped bios switch in the card to change bios. 5. Everything still working / clicked 'Program' in ATIWinflash. 6. PC froze after giving 'Vbios image not found' message as on pic below. 7. Had to hold power button 4 seconds to shut down. Tried to boot with previously bad bios / no go. Flipped switch back to good bios / worked. Tried the same thing again, as above. Got the same result. you can find it here in my post at bitcointalk. Thank you Heliox That sorta sent me on the right direction and I used your bios settings! ATIflash was not able to flash the bad bios so I just risked another card to test another undervolted bios. Once I had a working undervolted bios I used that on every card. I have not tested the MH or their stability yet but at least they are now working undervolted. 1. Right clicked USB Format Tool and ran as administrator. Did quick format of USB drive as Fat32 and also clicked 'create dos startup disk' and used/located the directory containing the win98 files above. 2. Now the bootable disk had only hidden files + Copied ATIflash.exe + undervolted ROM file (created with GPU-Z and edited with VBE7). 3. Made the USB drive the primary bootable drive in the mobo bios and booted PC with USB drive. 4. Keyed in: 'atiflash -p 0 newbios.rom', pressed enter and viola! Wala! 5. I then sang to my PC: https://www.youtube.com/watch?v=OAZG2duVte4 the second chance only needed a bios switch. Aha, i'm glad you made progress! Oh yeah i forgot to mention that, about creating a bootable usb, that that is even better. But! the reason why i don't use it, is because it just doesn't work on fiji based cards . So my only option was to use the one i shared . Good luck further! I'm sure you'll figure it all out and will have some fun while at it. When using vbe7, which core do you change? I see four cores, 6 and 0 are the last two listed cores with highest settings. Do you change all four cores, I cannot find anyone discussing that part of the program. I think you may be referring to VBE7, under the Powerplay tab. There are 4 core clocks that show in this tab, each with their memory clock and DVVC settings. 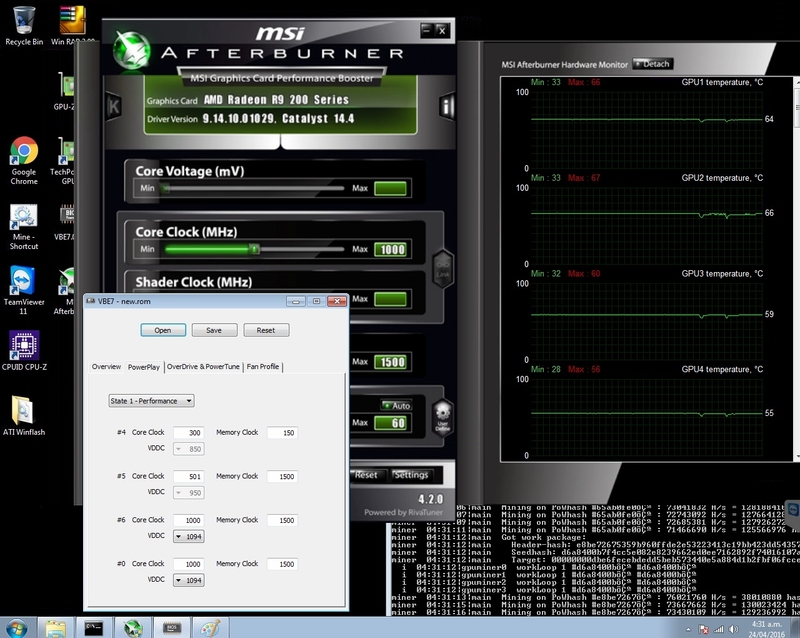 I changed my bottom two cores my voltage to 1094, 1000 core clock, and 1500 memory clock. I don't remember the default settings now but those are the only ones I touched, just the bottom two. With these settings my 4 x gigabyte R9 280x cards went from 83MH to 72/73MH. Before the change Kill-a-watt showed 600watts most of the time but flicked to 1070watts, often. I have no idea why kill-a-watt flicked numbers like that. Not sure if my set up was actually taking 1070watts. The above was all stock settings. My cards were going above 80ºC, too hot. Again, MH came down by 2.5MH per card, total of 10~MH lost. However, My cards no longer heat up like they did before, as the picture shows. With the new settings Kill-a-watt shows a stable 750watts being taken from the wall. 1.094v is too high. Try 1.050v on 1000/1500 should work fine. Also those fans on gbt are crap, so running them at 60% over prolonged period of time will take them out. Ok great, I will change core 6 and 0 only. I have original card bios saved, but was worried about bricking cards. I used to overclock before, but never messed with undervolting. I am running three cards on my rig right now. Should receive three cards back from Gigabyte this week I RMAed for fans. Hoping by undervolting it will drop tempatures and allow me to run rig with six 280x on one psu. From what you say, this might do the trick. Thanks again for helping me out. Omnik brings something else to think about though. Omnik, do you know what the MH would be around about, after changing to 1.050v? I have already lost ~10MH from changing this to 1.094v across 4 of these cards. Also, are you suggesting running the fans a max of 50% or something less than 60%? I have 19.7Mhs at 1000/1500. Lower voltage should not influence hash... only lower temp and fan rpm.